Could saving lives be your New Year’s resolution? The Welsh Blood Service is asking people in Wales to make a resolution that will last a lifetime by pledging to give blood in 2018. 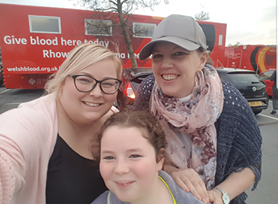 Last year, Kath Francis from Swansea made a New Year’s resolution to donate blood after her younger sister Sophie needed an emergency blood transfusion when she was just eight days old. Kath, who has a fear of needles, originally signed up to donate after sister Keris gave blood for the first time, Kath said “she sent me a message afterwards and I was so proud of her. “I decided at that moment I was going to go with her the next time, after seeing the difference the blood transfusion had made to Sophie. I signed up online and found a session, but bottled out before the day. “December came around and I was disappointed in myself for not having made a donation all year, so I made a resolution that in 2017 I would give blood! I plucked up the courage and made an appointment. I was so nervous but the staff there were lovely. “The feeling after I gave blood was incredible. I’ve donated ever since and even brought my friend along with me to give her first donation. Cath O’Brien, Director of the Welsh Blood Service said: “We’re asking the public to make a lifesaving resolution this year by giving blood. Research has shown that one in four people will need to receive blood at some point in their life, people just like Sophie, yet only three per cent of our population currently donates. Make a resolution that will last a lifetime in 2018 and give blood. Click here or call 0800 252266 to check your eligibility and book an appointment. Next Next post: Stanwell Comprehensive sixth formers lead the way for school blood donations in Wales.